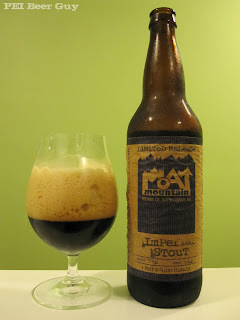 This was my first brew from Moat Mountain Smokehouse & Brewing Company in New Hampshire. This 9% beer is #796 of a run of 1162. This stout pours a very dark brown. The head on it ends up being just about the most impressive I have seen - very tall, slow to fall, rich, creamy, dense, lumpy, and brown. Lacing follows the head all the way down. It smells of dark chocolate, some raspberry, and maybe a bit of vanilla. It's sweet and also a little sharp. There's a hint of alcohol in the aroma... almost like a little... bourbon? In the flavour is coffee. It's also a bit tart and fruity. It's a bit like an oatmeal stout in flavour as well. There isn't much chocolate in the flavour, but there is some slight woodiness. It has a tangy feel on the sides of the tongue. The body's on the full side of medium, I guess, but - somehow - has a finish that is slightly watery. The whole bottle in one sitting was a bit much - it was pretty rich, and the last couple of sips were rather sharp. In its defense, I had a full stomach when I had it, though. Overall, a fairly tasty brew, but I wouldn't rank it on the top of my imp. stout list. Could it be the tangy, sharp and tart notes are just the diacetyl coming through? I'm not exactly sure what caused it - could be a combination of things. I didn't pick any diacetyl up when I drank it, though - didn't think anything really tasted unintentionally off. Had the opportunity to visit the brewpub with my wife during a shopping trip to NH. Situated at the base of the White Mountains, the old colonial home that houses the smokehouse makes outstanding food and great beer. Absolutely beautiful location.